When logged in as a user from Moodle, there is a link back to Moodle in your profile sidebar and also a mention of the Moodle instance in the "Online users" block. These aren't styled properly yet. The link in the profile sidebar needs to be an external link one from FrontAwesome. And the text in the Online users block would need to be put behind the user's display name. 2. 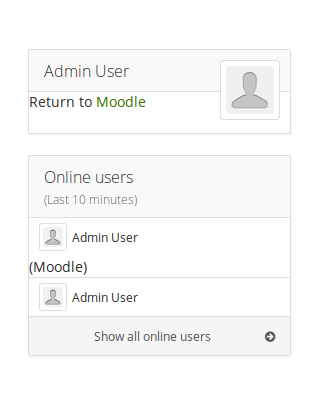 Mentioning of the Moodle instance in the "Online users"